“Our daughter, Eliana Rose, was born on Valentine’s Day 2018. We knew she was going to be something special. Shortly after conception, we were told her heart rate was very weak; and that we could expect a miscarriage shortly thereafter. A few weeks passed, and we went back in for a checkup- her heart rate was perfect! She was a healthy growing baby. Rather than enjoying some chocolates and roses, I was giving birth this Valentine’s Day. She was such a calm quiet baby, began nursing right away; her father Christopher and I were just smitten. She was very yellow and began having pale stools. Her indirect bilirubin levels were fine; so, we were not too concerned. After 7 weeks however, we decided to have her looked at. Her pediatrician noticed her spleen felt a bit enlarged, so we were sent for an ultrasound at Children’s Hospital Colorado. During this ultrasound they discovered that her liver and spleen were enlarged, and there was no gallbladder to be seen. This raised red flags for them, and they immediately began testing. At 7 weeks old, Eliana had her first procedure- a biopsy to aid in diagnosis. 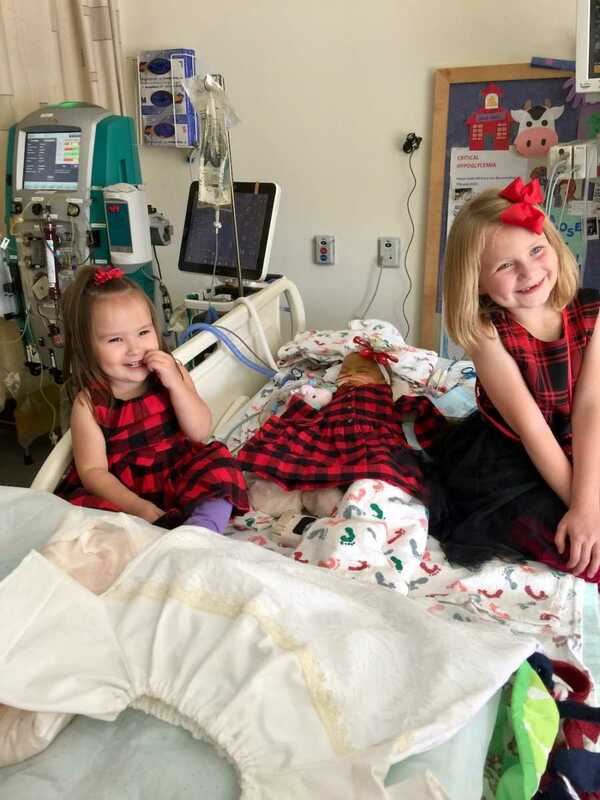 After her liver biopsy, the doctors sat down and told us they suspected she had a rare liver disease; affecting 1 in every 15,000-20,000 children in the United States. We were worried, but they assured us everything would be okay. Biliary Atresia; is a rare liver disease where a child is born without a biliary system or born with a nonfunctioning biliary system. 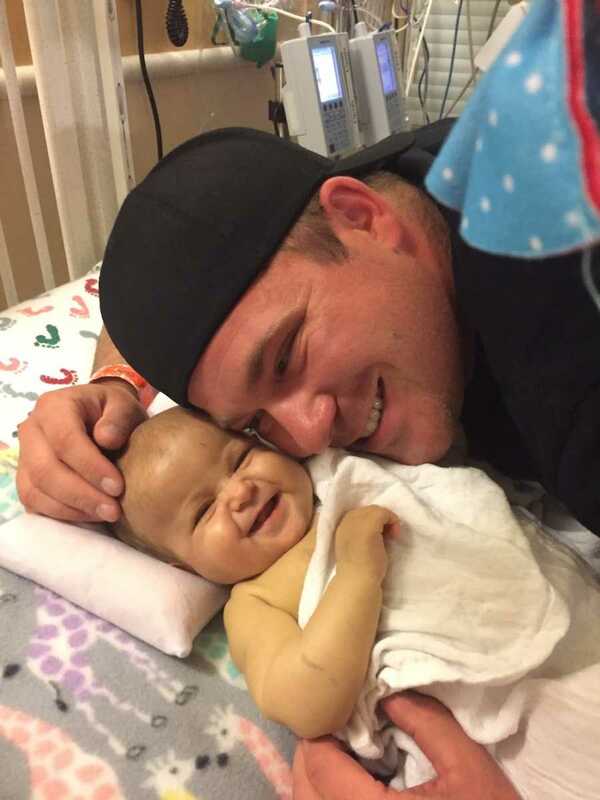 At 8 weeks old, Eliana experienced her first major surgery. This procedure was called a Kasai, which is the removal of the nonfunctioning gallbladder, and using the small intestine to try and fashion a biliary system to allow bile to leave her body and stop causing damage to the liver due to bile build up. This procedure works 1/3 of the time. She healed very quickly and was doing very well, we got to bring her home and we began NG tube feeds with special formula called Pregestimil for malabsorption problems (which effect many biliary atresia children). At 5 months old, Eliana was evaluated for a liver transplant; her Kasai had failed. So, her father and I, began the long process of meetings, and testing for this major occasion. 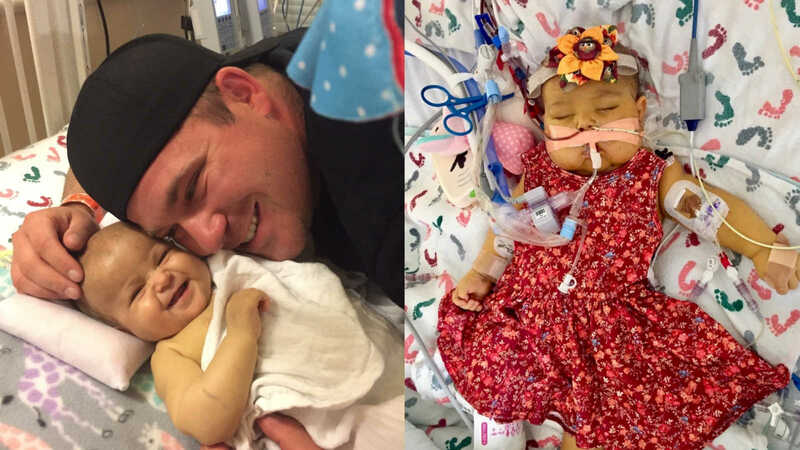 Eliana’s liver specialist said ‘I don’t think Eliana will need to be hospitalized until transplant’ hit us deep and hard, we thought there was no chance that our baby was going to lose this battle. During this time, a heart defect, coarctation of the Aorta, was discovered; so, during this time- Eliana underwent her second major surgery to repair her heart. This put a hold on things for a short time, but August 13th we were admitted to the hospital for the final time; our 8th stay in her short lifetime. We thought we were coming for a liver transplant, little did we know- Eliana wouldn’t be leaving at all. Once Eliana was placed on the transplant list with a peld score of 18 (lower list) she became ill and was quickly bumped up to a score of over 40 (higher list). We began weighing our options for living donation. Livers are incredible in that, a live donor, yes! Living donor!! Can be used to donate a portion of their adult liver to a child; we had an incredible woman offer to do this for us. The testing process for us, took 5 weeks and 2 days before our living donor was finally approved. Eliana’s father and I were both denied of being her donor, me due to my blood type not matching hers; and her father for being 7 pounds overweight. Yes… 7 lbs. Eliana began to deteriorate rapidly and was placed on IV nutrition called TPN and Lipids. Her abdomen became so distended that she no longer wanted to lay on her back or stomach; because it was difficult to breathe. Our living donor called us personally to tell us the wonderful news that she was approved and that we would go in for surgery in just a few short days! We cried so many tears of joy. We were relieved that our little girl’s suffering was about to end… and it did, just not the way we had planned or hoped. The day after our donor was approved, Eliana took a drastic turn for the worse. On the way to doctors’ visits hearing my grandfather say, ‘she may not make it’, and thinking it was totally wrong and that would never happen to us. We felt so much, that the worst that could happen was a transplant. After receiving her first blood and platelets transfusions; she spiked a fever. We were moved to the intensive care unit shortly after. During this time, she became so uncomfortable from pain; that we made the decision to intubate her- so her pain could be managed. After being intubated she started bleeding profusely from her mouth and nose; her father was showering, and I heard what sounded like crackling. I stood up and walked over to Eliana, only to discover blood bubbling out of her little mouth. This was so very scary for us, and kidney dialysis was started the next evening. She was at high risk for cardiac arrest, and we were told she may not survive the start of dialysis. But she did! We were so hopeful after this and remained positive. It took 5 days, for our baby to completely deteriorate. After being intubated, Eliana experienced complete liver failure; acute kidney and respiratory failure, along with 5 brain bleeds and 2 strokes- until her brain ultimately bled through. 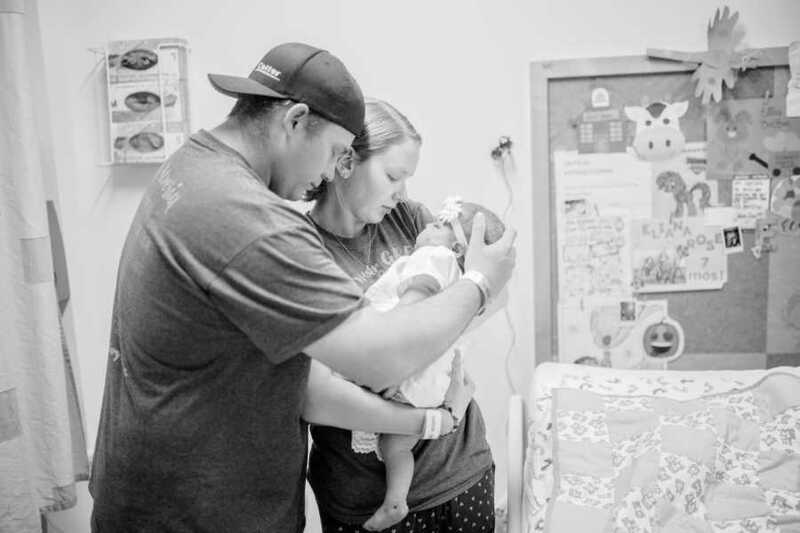 We were led to believe Biliary Atresia was fixable, we were told she would be okay. We were told she was strong; and would get her liver. 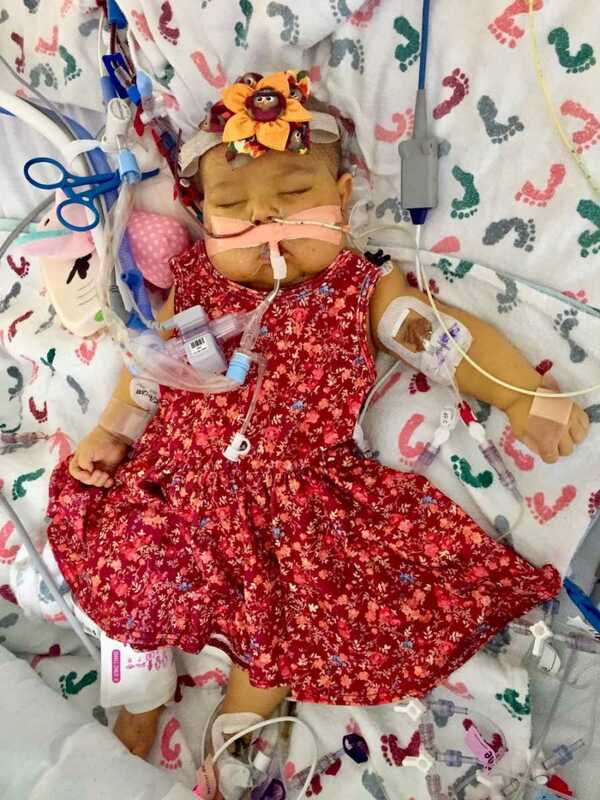 We were led to believe she wouldn’t need to be hospitalized- her liver specialist told us she couldn’t believe how strong Eliana was and that she would pull through. I remember, after the doctors told us they could do no more for Eliana, looking at Chris (Ellie’s dad) and saying ‘I can’t! I can’t!’, it hurt so much in my chest at that moment that I couldn’t say anything else. It all wasn’t true. Our daughter was taken off life support October 5th, 2018. She passed peacefully in her father and mother’s arms. The end of Eliana’s life, after the doctor said ‘She Died’ … it was almost a relief, because I knew she wasn’t hurting any more. I wanted to reach out and get this word out there. 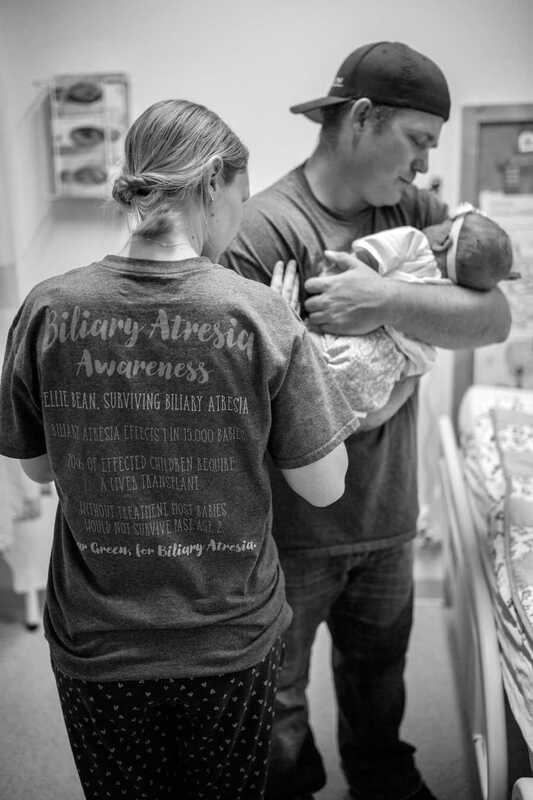 I had never heard of Biliary Atresia until my own precious baby was diagnosed. I had no clue what our lives would look like from there. I also wanted to get the word out about live donation! Please please please, consider giving the gift of life. Spare another child from this fate. I am forever grateful to the woman who was going to give a piece of herself so our baby could live. It should not have taken over 5 weeks, and shame on the transplant coordinators for allowing this! And know, you are not alone. This story was submitted to Love What Matters by Ashley Lawyer. Submit your story here. Subscribe to our free email newsletter here.